You can book Osprey Studios cabin on Airbnb. The site is very helpful and secure. The cabin has 2 single beds and is £40 per night. Home made meals can be served in the cabin for £5-£10 each. There are 3 award winning pubs within walking distance. To book the cabin and see more info about it go to our airbnb page. To see info w/ links about the area go to Visit the Studio (which includes an interactive map) or scroll down for the info sheet that has links. Set at the end of our garden which backs onto Cribarth, the Sleeping Giant mountain, the cabin has a beautiful view. Our aim is the close-to-nature feel of camping but with simple comforts. The off-road parking is easy and safe right here in front of my house and Studio. Ynyswen is a quiet, friendly, residential place with one handy Spar shop and a regular Bus Service that connects with Neath Train Station ( details below). You can take a variety of wonderful walks directly from here including to Henrhyd Falls. It is very quiet in Ynyswen. The cabin has the easy, secure convenience of being near the house and car parking but feels secluded and peaceful, especially when the vines are in full leaf and flower. You have your own patio set with potted herbs and flowers, a table and chairs and the wonderful view. The view from the Cabin shower/loo. The Cabin is just at the end of this short path. It gets wonderfully dark at night as the Brecon Beacons National Park has won Dark Skies Status! For most of the year the cabin’s private patio is sheltered by leafy vines making it feel surprisingly secluded even though you have the security and convenience of the house and street right there. In the winter there are ever-green shrubs slowly growing. Drinking water is on tap. There is no hot cooking allowed but picnics are fine. The blue container is a ceramic cooler-box that I made. The bright bins are for your recycling. View from the Cabin door. Dogs are very welcome here. There is a Hedgehog Hotel adjoining the cabin and you might be lucky enough to see the residents! The whole thing is an ongoing, family project and we add to it regularly. We are trying to make or up-cycle everything we can and it does get a bit wonky sometimes! My youngest son designed and built the beds: one rolls under the other. I am proud to say they are sturdy and very comfortable. There is electric heating, lights and super-fast broadband: we didn’t instal those ourselves! The sculpture garden changes all the time and most are for sale. In the season we put fresh berries and salad in the meals served in the cabin. The garden entrance. New sculpture gets added to the Sale Shelves regularly with prices starting at £1!. The cabin’s little shower-room is just inside the gate. The water pressure is fantastic and there is endless, piping hot water. Pirate, Coleford Brick clay. Photo by Stephen Foote. – So you can stay cosy in the cabin just send texts to Rebecca with enquiries and requests. Or knock on the door. – Loo paper is keeping dry in the purple container in the shower room. Help yourself to shampoo etc and there is a hand towel in the shower room. Your towels and face-cloths are on the middle shelf in the cabin. All meals are fresh, homemade and served to you in the cabin. Anything baked, jams, pickles and marinated antipasti are all homemade with quality ingredients, organic and local where-ever possible. A few fruits and veg are frozen, often from fresh, homegrown produce. You are always welcome to request a meal at any time but we usually serve dinner at 6.30 pm. Dinner is £7.50, dessert £2.50. Breakfast or lunch (including packed lunch) are £5 each p/person. – This is not a self-catering cabin. You may not cook hot food there. But cold picnic style food is fine. There are plates/cutlery/corkscrew in the basket on the 1st shelf and a few lidded boxes to store your snacks. – There is free fruit/tea/coffee/sugar on the shelf for you and we are happy to give you milk in a flask if we have it, just ask. – I will wash your laundry (£5 a load. It will take at least 24 hours to dry unless the weather is great.) Or we can lend you a tub if you want to do a hand-wash with the shower. – The Potter’s momentum wheel is free for you to play with any time. Clay in the green bag, just return all clay to the bag when you are done. Use the handy, multi purpose metal bowl on the shelf for water. Pets are very welcome to get on the beds, muddy feet but please keep everything dry! We have a dyson for when you have left. Please keep dogs inside the cabin patio and under control because our Friends of the Animals Wales foster cats need to feel safe. Some of the cats will come into the cabin with you if you like. You can walk your dog in the field on a leash: there are horses there and they will not tolerate a loose dog. It is often very muddy! The Henrydd Falls walk is the only sheep-free walk where a well behaved dog can be off the lead. Washing muddy dogs/people/gear: please feel free to use the hose on the covered porch by our front door. Or the warm shower. I hose out the shower room during your stay and disinfect it all when you go. Ask for a dog towel. Feel free to take the chairs out side to your Cabin patio. Sitting outside in the rocking chair with a duvet wrapped around you is bliss. Take them in so they don’t get wet. – The hammock is on the shelf in it’s green bag. Only attach to the pink labeled metal rings on the fence posts!! And I’m afraid only ONE adult at a time. – The whole garden is for all wild creatures. The brush/woodpile behind the cabin is for wildlife and a huge hedgehog lives in there! Him and the toads eat the prize-sized slugs and snails. The pond has frogs, toads, newts, dragonflies and all sorts of other fellows. No one gets killed by humans. Please be kind to any visitors that join you. – Osprey Studios is signed up to the Welsh Government’s Sustainable Development Charter. Please be frugal with the heaters; do not have them on when the door is open. Please don’t leave them or anything electric on while you are out. There are extra blankets and cosy wraps on the shelf. Please be kind to all critters including in the cabin and shower room. We will recycle your trash. – Ynyswen is very quiet and peaceful, especially at night. My neighbours are lovely people and many work early shifts. No music/radio/loud conversations/etc out-side please and keep volumes low in the cabin. – Park off road, in front of the house when possible, leaving room for my silver van. Ynyswen is a very safe, friendly place but can run short of parking. All the sculpture in the garden is for sale and there is a price list on the shelf in the cabin if you would like to see it. The Sale Shelves in the porch have bargains! Smaller sculpture is in the house. Visit the Studio: photos, links and info on this gorgeous area. Leaflets in basket on shelf. Please leave for future guests and add any from your favourite days out. The Ancient Briton, 1/2 mile, go left at the main road. The Penycae Inn, 1.25miles, go left at main road. Or over the fields- there are several lovely routes. The Abercrave Inn, 1.5miles. Go right at main road, 1st right after church. Or foot-paths. Changing Seasons Tea Rooms (great breakfasts! ), 3 miles, go left at main road. Or over the mountain. Visitor Centre, leaflets, beautiful walks. The Spar, Ynyswen, 100 metres, go left at main road. Post office/ cafe/ small shop: 1 1/2 miles, go right at main road, 1st right after church, follow road. Supermarkets/shops/take-aways/friendly cafes in Ystradgynlais, 5 miles, go right at main road. Tuition, workshops, studios to visit. Julia Harris, wonderful landscape and animal paintings and courses in Abercrave just a mile away. Leanne Vaughnan Phillipps M.A., excellent tuition in life drawing. Arts in the Tawe Valley, a collection of wonderful local artists from many disciplines with the beautiful Lliw Gallery in Pontardawe Arts Centre. left at main road, 3 miles, opposite Craig y Nos Castle. The most fantastic day out for anyone! left at main road, 3.5 miles. Great news! Bus travel in Wales is FREE at weekends (This link takes you to the site w/ route planner) Please double check time-tables at the bus-stop or online as they change without notice. Free Travel on Weekends with TrawsCymru! As TrawsCymru services are likely to be busier than normal on the days of the free travel promotion we may provide additional buses. Please be sure to check the destination display clearly or ask a member of staff to ensure you board the correct bus. If you are in possession of valid Welsh Concessionary Travel pass we ask that you continue to show this to the driver as normal on the days of the promotion. Whether you are going for a picnic, a hike, to visit a castle or go on a shopping trip, we hope you enjoy our free travel offer. Happy Weekend! Celebrate National Parks week in the Brecon Beacons! National Parks Week is the National Parks family’s annual celebration of everything that is unique and wonderful about Britain’s breathing spaces. It runs from Monday 24 to Sunday 30 July 2017. With diverse landscapes, activities and events there’s an adventure waiting for you here in the Brecon Beacons! The Brecon Beacons National Park covers a staggering 520 square miles! The batcave in the 2012 Batman film The Dark Knight Rises, was hidden behind Henrhyd Falls, the tallest of dozens of cascades in the western Brecons Beacons, the bit of Wales known as ‘Waterfall Country’. Plan your adventure to the Brecon Beacons National Park here. How will you #FindYourEpic? Conquered Pen y Fan? Did you know we have 1,200 miles of public rights of way for you to explore? Here are our favourite walks in the Brecon Beacons which have equally beautiful views to enjoy and have plenty of Epic selfie opportunities. 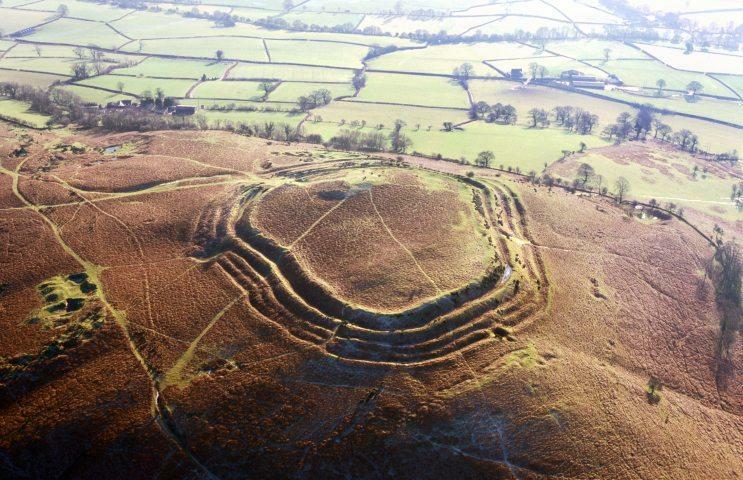 – Pen Yr Crug-one of the most impressive hillforts in the Brecon Beacons National Park. Standing on the summit of a prominent hill above the Usk Valley, this is one of the most impressive hillforts in the Brecon Beacons National Park. The remains of Pen-y-Crug hillfort can be found on The Crug, a hill 1.5 miles northwest of Brecon, at a height of 331m. Its ramparts, which today are rounded earthwork banks and ditches, would once have been impressive stone and earth revetments with a wooden defensive palisade built on top. They allowed those who occupied the hillfort to defend themselves and proved a formidable obstacle to anyone attempting to attack the settlement. Entry to the interior of the hillfort was gained through a single well-guarded entrance on the southeast side of the hillfort. The hill has extensive views of the central Brecon Beacons, and also views to a number of neighbouring hillforts including Coed Fenni Fach on the adjacent (now wooded) hill and to Twyn-y-Gaer on Mynydd Illtud on the other side of the valley. More info here. – Allt Yr Esgair-Panoramic views of the Usk Valley to the west and south and across Llangorse Lake to the Black Mountains to the northeast. https://www.instagram.com/p/BVDZdwTFUF9/embed/captioned/?cr=1&v=7&wp=638#%7B%22ci%22%3A0%2C%22os%22%3A9539.305%7DWe Love this video taken by Nigel Forster Photography! Allt-yr-Esgair is a hill with panoramic views of the Usk Valley to the west and south and across Llangorse Lake to the Black Mountains to the northeast. In Welsh, Allt-yr-Esgair means wooded slope of the ridge. Locally, the hill is known as The Allt. The summit (393m) is crowned by a hillfort presumed to be of Iron Age origin, one of several in the Usk Valley. The Roman road that links the Roman fort of CICVCIVM at Y Gaer, Brecon and Gobannium at Abergavenny runs along the ridge. More info on the hill here. – Mynydd Troed-Great Views of Llangorse Lake with it’s name meaning “foot mountain” based on how it appears when viewed from the Allt Mawr ridge. The hill is designated as open country and therefore is freely accessible to walkers, with great views even when the Black Mountains are in cloud due to its lower altitude. – Sugar Loaf-Panoramic Views of the Brecon Beacons and beyond. This big, bold, bald hill, at 596m, has a magnetic quality – everyone who visits Abergavenny just has to climb it. They’re rewarded with one of the finest views on the planet, as mountain ranges roll away for 360 degrees in great waves of green. Look west to the flat-topped central Beacons, north-west to Pen Cerrig-calch, north to the Black Mountains, north-east to Hatterall Hill, east to Skirrid Fawr and south across the Usk valley to the Blorenge. What a panorama! Looming over Crickhowell, it’s easy to see why this 451m peak was thus named. Sloping at a slightly tipsy angle, its flat top is an iconic Brecon Beacons feature. Etymologists will be interested to learn that Crickhowell’s name derives from this lofty spot. It’s an Anglicization of Crug Hywel, or Hywel’s Fort, a reference to the Iron Age hillfort that crowns Table Mountain. Despite the exposed, weatherbeaten location, extensive remnants of this ancient Celtic stronghold still survive in the form of ditches and ruined stone defences. The views are sensational. At your feet gazing westwards you have the lovely Usk valley rising into the central Brecon Beacons and industrial valleys of South Wales, while the brooding Black Mountains look over your shoulder. Click here for a walk up the mountain. – Carmarthenshire Fans-atmospheric surroundings and truly stunning views. Highest Peak: Fan Foel with Picws Du being the second highest peak. The Legend: The place is steeped in legend, and has a close association with the Physicians of Myddfai, the true history of whom has become inextricably linked with the legend of the Lady of Llyn y Fan Fach, a famous Welsh folk tale. According to the legend, the Physicians of Myddfai were descended from a beautiful fairy who lived in the lake. This fairy was wooed by a local shepherd boy, and they eventually married and set up home at Esgair Llaethdy, a farm near the village of Myddfai, where they raised three sons. Following three “unjust blows”, the Lady left her husband and returned to the depths of the Lake, but before she went she taught her three sons the arts of healing and showed them where to find the necessary herbs, all of which grew in profusion in the area. According to one version of the legend, her eldest son was named Rhiwallon. What is certain is that, in the early 13th century, a man named Rhiwallon Feddyg was the personal physician of Rhys Gryg, Lord of Dinefwr and the warrior son of the Welsh Prince, Rhys ap Gruffydd. 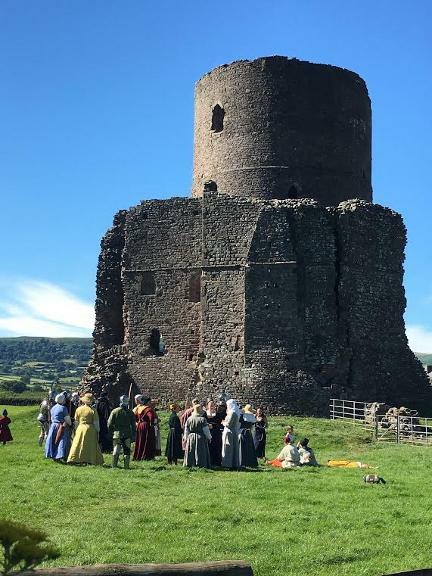 Rhiwallon had three sons, Cadwgan, Gruffydd and Einion, and they and all their descendants became famous for their skill as doctors, not only in Wales, but throughout the UK and Europe. Their medical wisdom is recorded in the Red Book of Hergest, which dates back to the 13th century, and several of their original manuscripts are held in the British Museum. These show that their healing powers were based upon a materia medica of about 175 herbs, all of which grew locally, and many of which still thrive in the area. The last named “Physician of Myddfai” died in 1842, and his tombstone lies in the porch of the village church. We hope you enjoy these walks and make sure you share your Epic photos with us on Instagram using the hashtag #visitbreconbeacons. Click here to discover more walks in the Brecon Beacons! Kevin Walker Mountain Activities is a small, long-established mountain activities training business based in the Brecon Beacons National Park, but working all over Wales. They pride themselves in providing the highest quality instruction and guiding delivered by friendly, experienced, enthusiastic, qualified, mature instructors. Almost every region in Mid Wales has something interesting to discover – quiet villages, stunning scenery, historical buildings lost in the countryside…so before rushing to visit the most popular regions why not think about somewhere else for a change? You can avoid the crowds and still have a great time discovering the ‘real’ Mid Wales! Brecon Beacons Tours offers Sightseeing Tours and Walking Tours in the Brecon Beacons National Park in Wales. Our tours start either at Abergavenny station, the gateway to the National Park, or your Brecon Beacons based accommodation. Abergavenny station is only 40 minutes from Cardiff and 2 hours from London, so our tours can be done as day trips from many UK locations. You can even combine your tours with stays in our B&B accommodation to make a complete break. Additionally they also offer bespoke, geology and fishing tours. Learn about the legends of 7 castles and 2 medieval houses on their Castle tour, or learn about the history of the Park on a fascinating tour that explores how the area was central to the Industrial Revolution with tramroads and canals criss-crossing the landscape. They offer plenty more tours, click here for more info. Click here to discover the stories and legends of the Brecon Beacons National Park or click here if you need somewhere to stay!